For my 11th Day of Christmas, I am giving a gift to myself. Happiness. Right now our nation needs some happiness in our lives. I do not want to talk about what happened last week in Netwon CT but I know it has affected every single American one way or another. I personally haven't been this sad since 9/11. I was asked to watch the Happiness Film on GaiamTV, I quickly realized this would be the first time I have watched a documentary online. This film that took me on a journey from the swamps of Louisiana to the slums of Kolkata in search of what really makes people happy. After watching this thought provoking movie, I sat back and reflected on my life. What are a few things that make me happy? What are the non-material things that make me smile a little more throughout any given day? I am using non-material due to the fact that new shoes make me very happy but the feeling goes away quickly (hence why I own over 100 pairs). Some of the individuals featured in the movie Happy had living situations that you nor I could ever imagine. Yet they were still happy, some without a single pair of shoes. 1. My family. I am extremely close with my Mother. I un-expectantly lost my Father when I was 24 years old. Not a day goes by where I don't miss him and this time of year is always hard. Certain songs and movies remind me of him. Through the years, instead of reflecting on the sadness, I use those memories as happy thoughts. Moving across the state was extremely difficult to do due to the closeness relationship me and Mom have. My step-father stepped up and is an amazing father figure and I could not imagine our life without him. My family means everything to me and I cannot wait to spend time with them over the holiday's. 2. My boyfriend. I met Gabe for the first time when I was 17 years old. His sister Emily was a good friend of mine in High School. He is her younger brother. 13 years after I met Gabe, my Step-Brother got married. At his wedding, I saw a good looking guy across the room who was very familiar. After some inquiry, I found out this guy was Emily's brother Gabe. We talked about our families, me finding out Emily was about to have her first baby, and instantly had a connection. We started dating a few months later and here we sit three years later. I cannot imagine my life without Gabe. 3. My friends. I met my best friend Keri when I was 7 years old. We shared a desk and were separated within the first week of meeting (talking too much). Over 25 later, we are as close as ever. I met my friend Darlynn when I was 23 years old. I was her banker and had to help her consolidate credit cards. We had all the same store cards and I knew instantly we would be close friends. Moving away and meeting new friends was very hard. A year and a half after moving, I have an amazing group of Tampa friends who I love dearly, Leslie, Lauren and Katie. I am so thankful for them being in my life. 4. My animals. My cat Boo-Kitty lives with us in Tampa. He is my 20lb fur-baby. My dog Deezyl, lives with my mother in Daytona. Everytime we come into town, I make a pit stop at the house to get dachshund kisses. Both of them are my bud's and I love them both dearly and in return, they show me unconditional love. 5. Being me. I love that I do not have to change who I am to appease anyone. I am comfortable with me being me. I was a kid who always followed the in crowd or tried to change myself to fit in. Now that I am in my 30's, I am 100% Megan, an adventurous girl who loves trying out new cuisines, drinking too much wine, running, reading, going to the beach and watching college football. So now I ask you, what makes you happy? 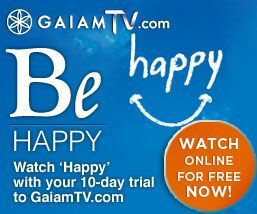 Gaiam TV is offering a free 10-day trial and I encourage you to watch Happy. GaiamTV offers top documentary films, fitness tv (including amazing yoga), television series and much more. Plus, when you sign up for a free 10-day trial using this link, you’re automatically entered to win a 3-month subscription and a cozy, organic fireside blanket (Over $125 Value!). You can follow GaiamTV on facebook by clicking here and on twitter by clicking here. This post was sponsored by GaiamTV The opinions are completely my own based on my experience.